Tucson and southern Arizona are famous for beautiful landscapes and lush desert plant life. Many of those spectacular, hidden canyons and elevated vistas contain some of the finest gated communities one could imagine. Close your eyes and visualize yourself looking out from your patio over the whole Tucson valley. The night desert view sparkles from the Tucson city lights. Or maybe you dream of relaxing in your crystal clear pool overlooking the meticulously groomed greens of one of Tucson’s premier golf courses. If privacy and security are at the top of your list, there are plenty of awesome choices available in Tucson, Arizona and surrounding southern Arizona communities. All of these visions are possible in Tucson, Catalina, Marana, Oro Valley, Sahuarita, or Vail. 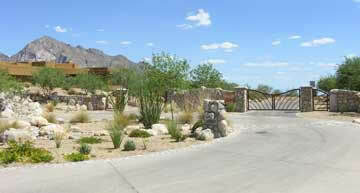 Let Kai Associates lead you to any of the exclusive gated communities located throughout the Tucson region. Search the area links to the right for your next Tucson Gated Community Home!